The recent collaboration between Secuoyas and IE has crystallized in a notable editorial product. 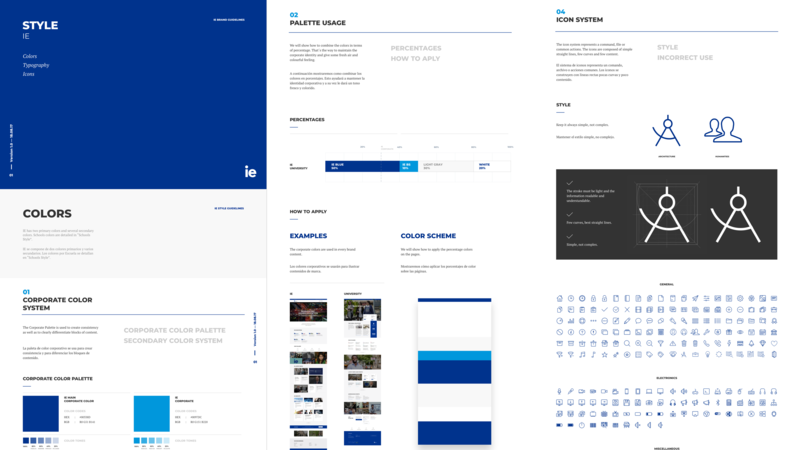 It offers a solution to the demanding requirements for on-line publication of IE (the ‘Instituto de Empresa’, the Business Institute), both in design, speed of publication and flexibility to change track. 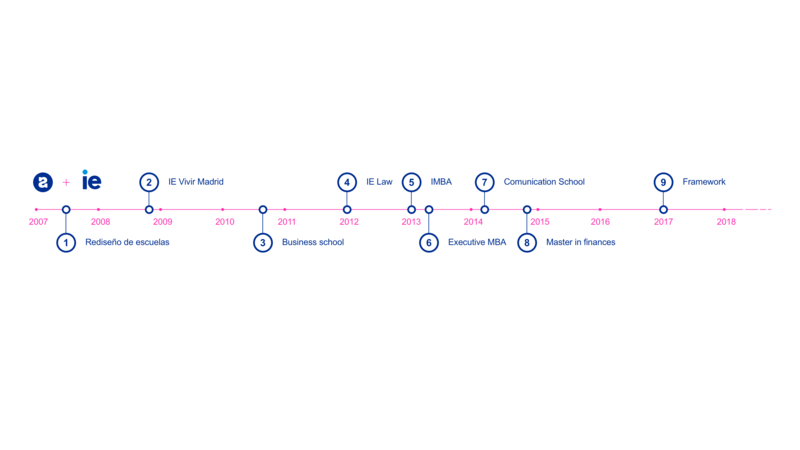 The data speaks for itself: the IE marketing department has been able to reduce the Time to Market, which is critical for its business, from an average development time of 2 years for each business school to being able to publish ALL schools in just one year. The evolution of the editorial product has enabled an organic growth in each of the schools. But the authentic operative achievement is based on the perfect symbiosis between the human teams on each side, based on the Agile software development philosophy and using the Kanban method, empowered by improved communications. Our relationship with IE goes back to 2007. Secuoyas has been side by side with IE throughout its digital growth, which involved several transformations. At the same time, parallel projects with other clients in the EDTECH sector, such as the Oxford University Press have provided us with a wider view and broader knowledge of the sector from our perspective as specialists and designers of interactive systems. The experience that we have accumulated in the education sector confirms us as authentic experts in the subject. The Business Institute is a leading organization with seven large schools or training centres. It is divided into dozens of different programs that commonly require communications support in the form of mini-sites and events. Each school offers its best in each course, seeking young international talents, to seduce them into attending the courses in the IE campuses in Madrid or Segovia, or even studying the courses at home. Constant high-quality renewal and communicating effectively on-line are the pillars of the Business Institute’s training offers. 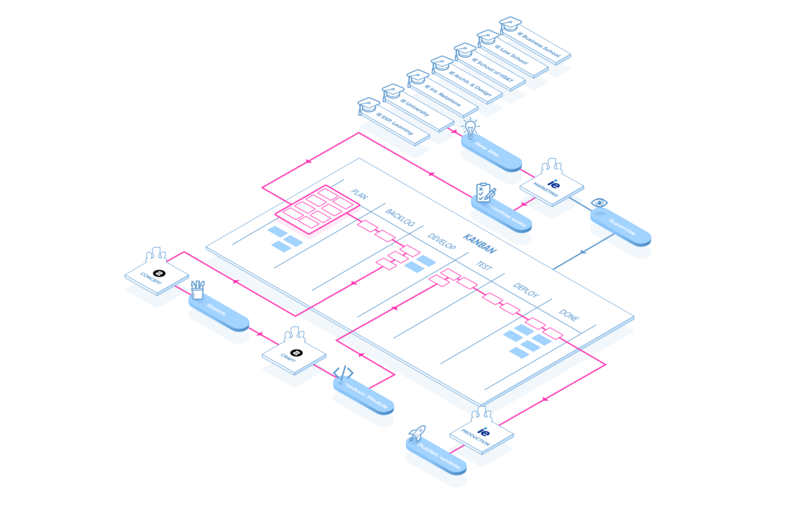 Starting with a basic modular framework previously conceived by IE, Secuoyas created the ecosystem required to get it running and convert it into a viable project. Initially, all of the design work was unified via a style guide, establishing clear boundaries between what could and what should be done. This gave form to a branding that became increasingly coherent. The development team settled down and defined a stable development environment that could be built on. 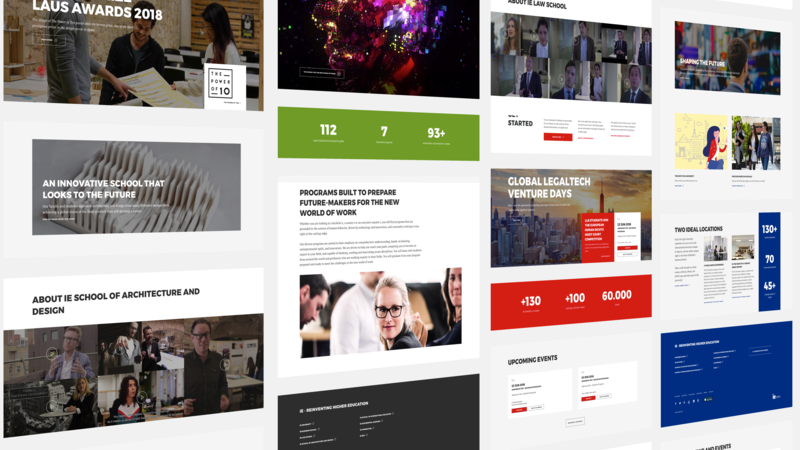 The project moved from a set of plug-ins, themes and initial modules in a mono site to a multi-site, and they evolved, creating transversality between sites. After this, the business structure was defined as a collaborative framework in which the human teams on each side could communicate and advance in the same direction. This completed the major planning steps. The mental model of “unique product” was implanted. And step by step, task by task, the IE product owners could redefine the course of each school, complying with their ever-changing publication targets. 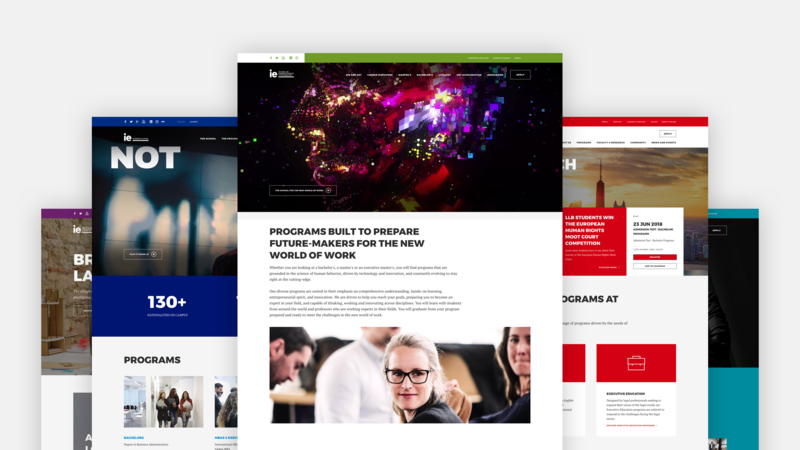 Using the Taiga project management platform and applying the Kanban method, we integrated their demands into the current work pipeline of both the visual designers and the developers in charge of integration into the final CMS. · A team of twelve people from Secuoyas and IE dedicated entirely to the program. · Fifteen projects developed in one year. · Thirty sites published between September 2017 and August 2018. 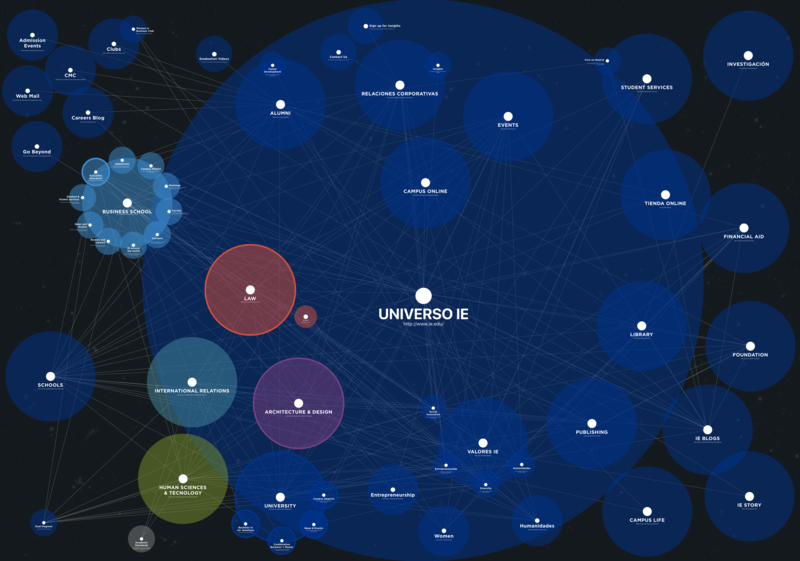 · Almost one hundred different modules form the site ecosystem. · Creation of new types of content and site-construction templates. · About four hundred requests handled and resolved during product support. · Progress indicator dashboard: backlog size, requests in each Kanban stage and KPIs for request input, output and resolution speed. One year later, we can proudly claim success, we have improved the business capacity of our client and we ourselves have evolved. We now have the knowledge and the technology to allow us to work with any modern educational business that wants to digitalize and needs guidance in the necessary structural modifications.